Want a good way to build and tone your legs without having to lift heavy weights? Yesterday I put together and tried a workout for the first time, and although it was hard, it worked great. The important part of this workout is to really monitor your rest time. If you go light, but take small rests between each set, you will be working your muscles in an effective way. Try this workout and let me know what you think! Superset of Squats and Deadlifts. This was the entire workout that I did and now my legs are SORE! It was a great way to change up my normal workout. Below are some tips on how to perform these exercises correctly and find weights that would work well for you. For the Weighted Box Jumps, I used a 24″ box and held a 16kg Kettle Bell. When doing this exercise, I really made sure to get my squat down as low as possible before jumping to the box. If you are not comfortable with weighted box jumps, start with no weight at all, or if you are just learning box jumps, start with a smaller height. The insane Squat and Deadlift Superset is the big strength portion of this workout. I used 135lbs for both exercise and I was exhausted. My max weights for both my squat and deadlift are over 300lbs, so DON’T go heavy with this superset. Choose a weight that you feel comfortable doing 20-25 reps with in a normal set (usually 50% of your max weight or less). Start with 10 squats, wait 45 seconds, do 10 deadlifts, wait 1 minute, and then repeat this cycle starting with the 10 squats again for 9 more sets. 10 full sets will take about 30 minutes. Make sure to get low with your squats and also really keep the tension out of your back for both exercises. For the toning exercises, I really just wanted to exhaust some of my leg muscles. Trying to only keep about a 60 second rest in between each set, I did leg extensions, abductors, and jumping lunges. By the end of this workout I was drenched in sweat and my legs were numb. Let me know what you think of this workout. Were you able to do the whole thing? Did you make any changes that worked well for you? Contact me at corestrengthalec@gmail.com with any questions, comments, or ideas or new topics. This is a workout I did the other day. I was pleased with how well it worked and how efficient it was. It did not take too much time, but I definitely felt a great pump and was sore all over the next day. Try it out and let me know what you think. 30 minutes of moderate intensity cardio. 1. For my moderate intensity cardio, I decided to walk at 4.0 speed on a 7.5% incline on the treadmill for 30 minutes. This burned a little over 300 calories. 2. When I say “3 Drop sets of seated rows. 10 reps each,” start with a heavier weight and do 10 reps of seated rows. Immediately after, lower the weight and do another 10 reps, and then lower it one more time and do another 10 reps. You will do 30 reps total during this drop set, and eventually end up doing 120 total after you do the 4 rounds of that super set. I ended with doing 120lbs, then 80 lbs, then 40 lbs. 3. During the “50 reps of Lsit pull-ups,” you can break them up however you want. I did 10 sets of 5 reps with a 30 second rest in between each set. Also, during this exercise, you can use a wide grip, or a close grip. 4. When I did the “10 handstands until failure,” I did mine off the wall and just tried to hold my position. If you are not comfortable with handstands, try holding the handstand against the wall for as long as you can. 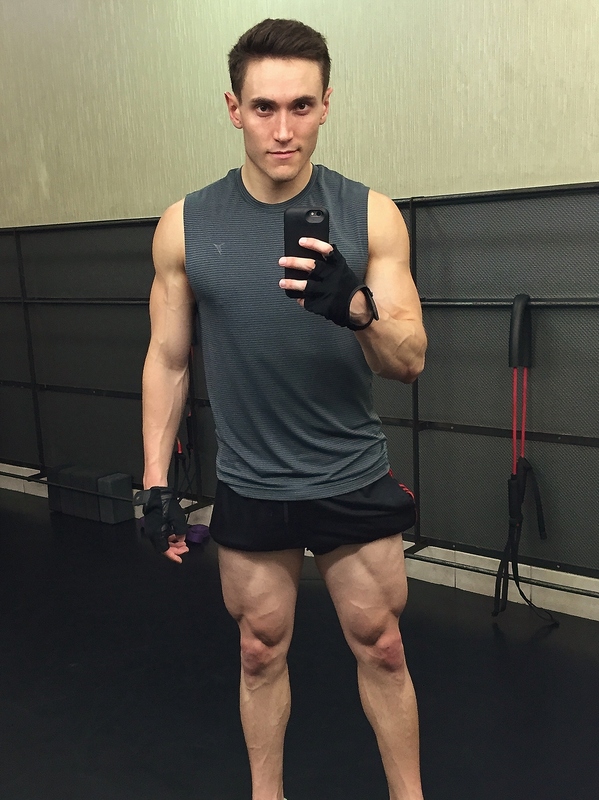 This is a move I just started adding to my leg day routine, and it kills my legs! You will feel your quads, glutes, and hamstrings burn and swell. This move may feel weird at first, but once you start understanding the mechanics and form, it is a great exercise to add to your leg routine. 1. With a bar set on the squat rack, load the bar with the appropriate amount of weight. 3. Set your feet slightly closer than shoulder width apart, but not completely together. 5. When you are as low as you can get, push through your heels to return back to the standing position. 6. Repeat steps 4-5 for the allotted amount of reps.
1. Be careful of your knees during this exercise. During the entire movement of the squat your knees should stay in line. Make sure they do not start moving in toward each other. If they do, this will easily cause injury. When pushing up, I try to focus on pushing me knees slightly out to avoid them from caving in toward each other. 2. This is another exercise that is all about control and less about weight. Although the resistance of the weight is important, if you can control the movement of the exercise and perform this squat with slow, but strong movements, you will definitely feel and see a change in your legs. 3. When squatting, try to get your legs to at least make a 90 degree angle, but lower even more toward the floor if you can. A wider range of motion will cause your legs to work harder which will then lead to more strength gains. If you cannot lower to create a 90 degree angle, you may be lacking flexibility in your hips. Stretching regularly will help alleviate this issue. 4. Push through your heels to activate your hamstrings and give your movement more support and power. 5. I recommend starting this exercise with a very small amount of weight to get the movement down first. Once you have gotten used to the motion, slowly add on weight to see what weight is challenging, but still comfortable for you. You will probably not do the same weight you use for your normal squat. Right now, for my narrow squat I do about 5 sets of 10 reps 185lbs, while for my standard squat I can do 10 reps of 185-225lbs, and my max squat is 330lbs. 6. As you can see from my picture, my feet are turned out. Growing up as a dancer and also being bow Legged, my legs are more comfortable in the position. When I put my feet straight forward and parallel to each other, I feel a lot of pressure on my knees. Try to have your feet straight on, but also know your body and its limits. If you need to turn out your feet as well, do so. Have you ever tried a narrow squat? 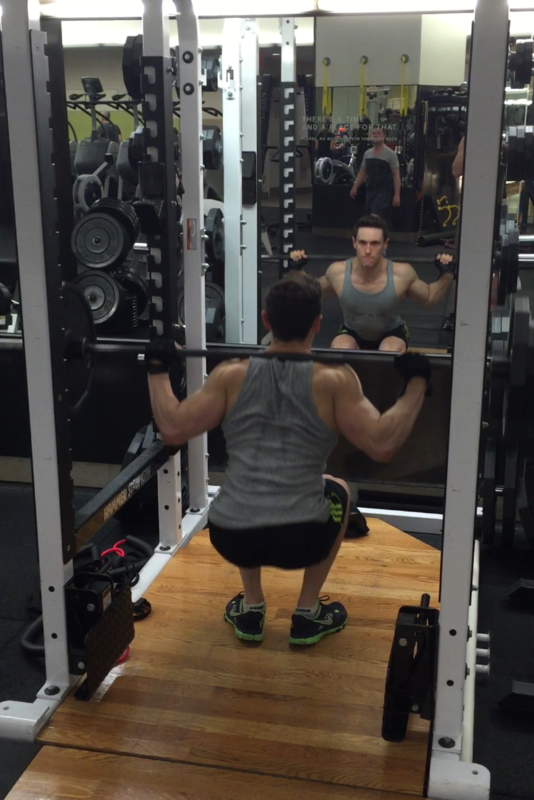 If you add narrow squats to your leg routine, let me know what you think. Contact me at corestrengthalec@gmail.com with any questions, comments, or ideas for new topics! Similar to a standard deadlift, the Sumo Deadlift helps build and strengthen your legs and back muscles. Most of the strength should come from your hamstrings, glutes, and adductors, but muscles in your core, back, and forearms are also needed for stabilization and grip strength. 1. Place a bar on the ground and load it with the appropriate amount of weight. 2. With the bar below you, set your feet in a wide stance. The bar should be touching your shins. 3. Bend at the hips and grab the bar. Your hands should not be wider than shoulder width apart. 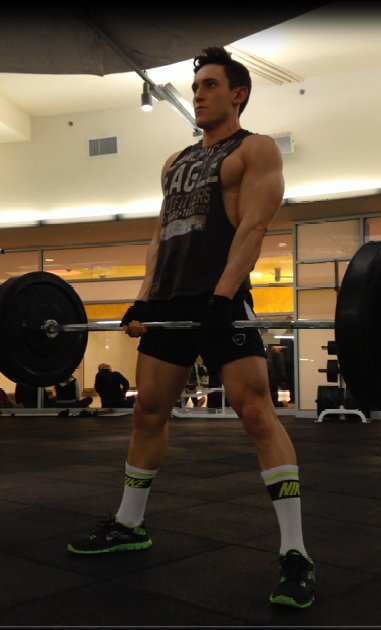 Contrary to a standard deadlift, your hands should be between your feet, not on the outside of your feet. 4. Lower your hips slightly and keep you chest up. Have a tight grip on the bar and activate your lats. You are now in the correct position for the sumo deadlift. 5. By pushing through your heels and activating your hamstrings and glutes, pull the bar up off of the floor. The motion should be coming mostly from your hips. 6. 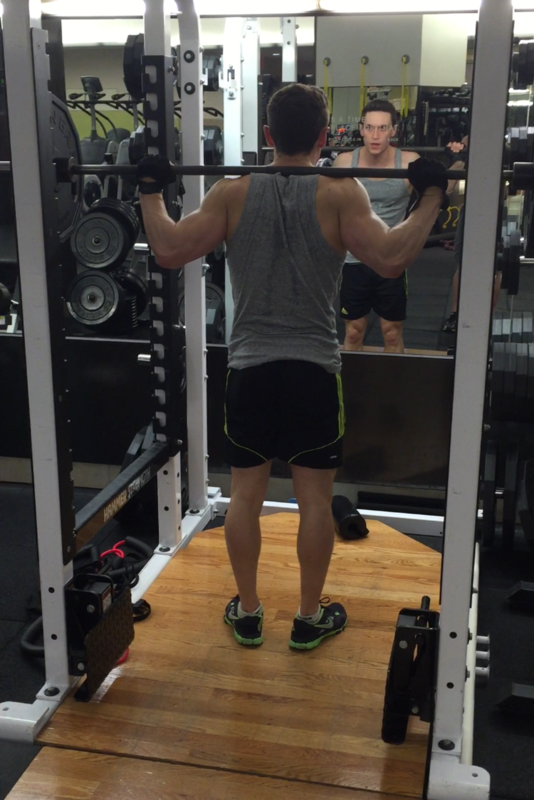 Once the bar is past your knees, drive you hips forward and lean slightly back. At the peak of the lift, you should be squeezing your glutes with your legs straight, and your lats should be activated with shoulder blades together. 7. To lower the bar back to the ground, hinge at the hips. Keep your back activated and control the motion down as much as you can. 8. Repeat steps 5-7 for the allotted amount of the reps.
1. The amount of weight all depends on your progress with weighlifting. For beginners, start off with just the bar to work on your form, and then add weights slowly. 2. Lower your hips slightly and keep you chest up. You do not want to be hunched over. 3. Any variation of a deadlift can be dangerous is not done correctly which is why form is so important. Really push through your heels and keep as much strain out of your lower back as possible. 4. At the peak of the lift, hold the position for a second and really feel the nice squeeze in your glutes and hamstrings. 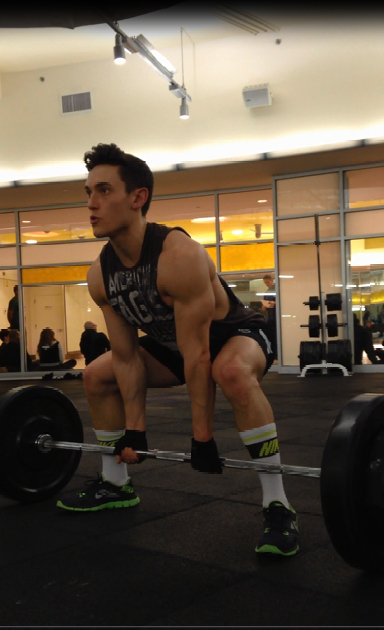 Have you ever tried Sumo Deadlifts? Let me know what you think! Contact me at corestrengthalec@gmail.com with questions, comments, or ideas for other topics. Yes you read the title correctly; this exercise is actually called the Svend Press. The Svend Press is my favorite exercise to target my inner chest. The movement requires you to flex your chest why pressing a plate. 1. Hold a plate between your hands. Your hands should be on the flat side of the plate, therefore you will have to press your hands against the plate to hold it. 2. Extend your arms and press the plate forward. 3. Bend your elbows and bring the plate in front of your chest. 4. Repeat steps 2-3 for the allotted amount of reps.
1. Keep your chest activated during the entire exercise. 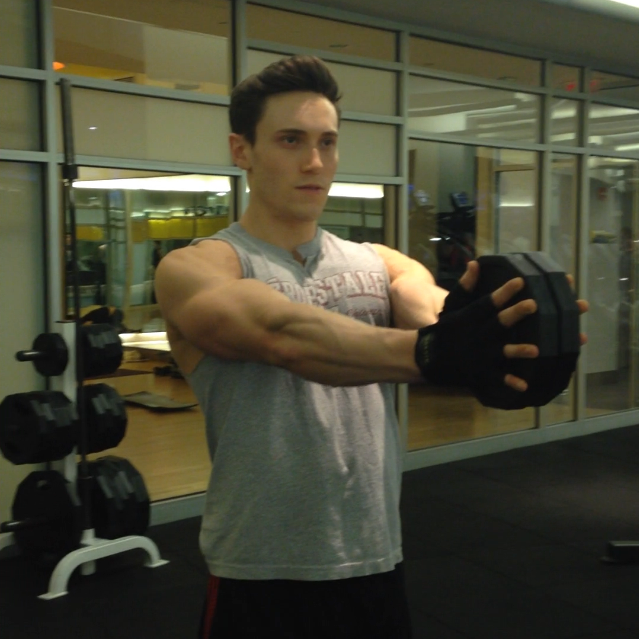 When you press against the plates with your hands, you will feel a nice contraction in your inner chest. 2. You can press one plate or multiples plates at the same time. In the pictures, I am holding two 5lbs plates. 3. 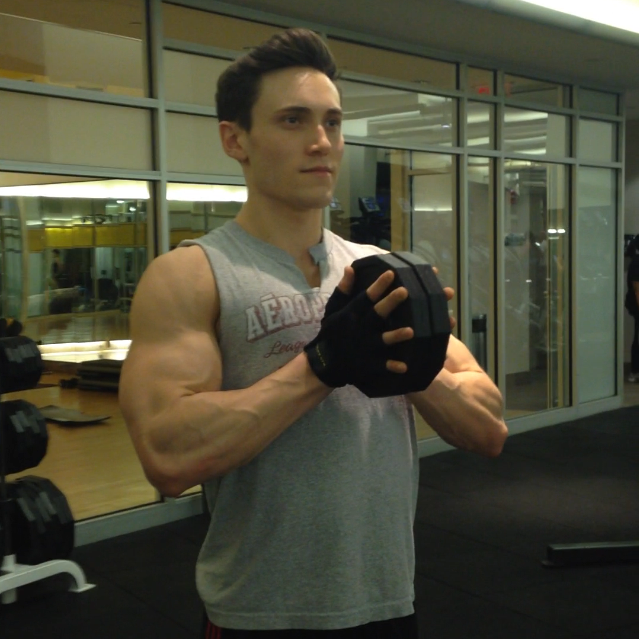 Make sure to keep your shoulders back and really squeeze your chest when your arms extended. 3. I like to do this exercise standing up, but it also can be done lying down on a flat bench or on an incline bench. 4. You will not have to start with a very heavy weight. I currently only use 10-20lbs to do this exercise. 5. Slower controlled motions will make this exercise more effective. Fast pulsing motions will not activate all of the muscles in your chest and put a strain on your shoulders, defeating the purpose of the exercise. 6. Try aiming to do 10-15 reps of the exercise per set. If you can easily go over 15 reps, increase the weight. Watch a short video of the exercise being done by clicking here! Have you ever tried a Svend Press? Let me know what you think! Contact me at corestrengthalec@gmail.com for more questions, comments, and ideas for new topics. 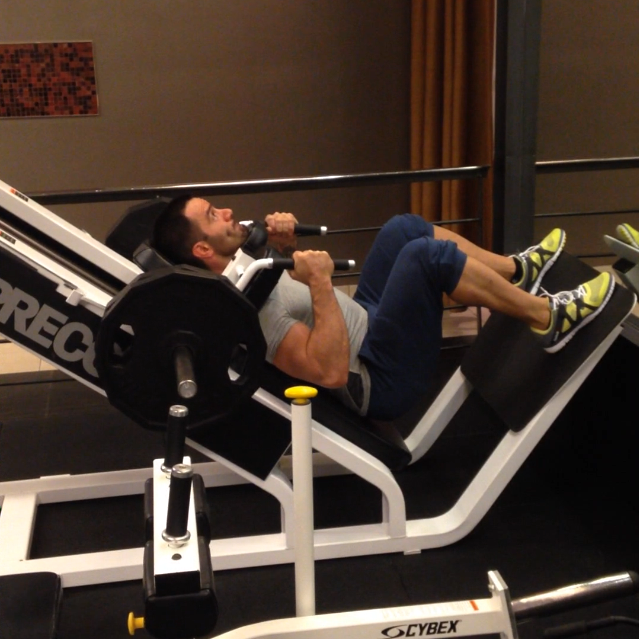 Yesterday my friend Ramin and I were short on time, but we wanted to get in a good leg workout. This is what we did in just a little over an hour, and trust me, this morning I am feeling it! 1. During our Warmup sets, we would do a light weight (about 50% of our max) and do about 15 reps. During a Working set, we would do a much heavier weight (75-90% of our max) and do anywhere from 6-10 reps or until failure. 2. The important part of this workout is to not take very long breaks. In between each set, maybe take a minute to rest and then get back into it. You really want your muscles to be working hard the entire time. 3. We ended up doing a Superset of the Seated Leg Curls and the Glute Master Machine. During a Superset, you do one exercise and immediately go to the other exercise, then rest after you finish doing both. This will keep you heart rate up and keep those leg muscles activated. 4. For the Pistol Squat variations you can do whatever makes you comfortable. I was practicing my Pistol Squats on a Bosu Ball and I was doing walking Pistol Squats; however if you are not comfortable doing them, you can try doing Pistol Squats holding a TRX or even a chair or rail. Do something that makes you comfortable, but also challenges you. 5. Do not forget to stretch, especially on leg day. You need to lengthen the muscles fibers and release some of the tension and lactic acid, otherwise you will not be able to walk tomorrow.